This is Samiyah. She is a freshman at a public high school in Raleigh, NC, and enrolled in a Math III Honors class. If she passes this class, she will only need one more math class to graduate high school. This means that she is two years ahead of her peers in this subject and on course to enter college with earned math credits if she takes AP higher-level math courses. But she might not get there with her intelligence alone. Access to a basic textbook may derail her. Overworked teachers who lack basic resources are at play. As a parent, I am forced to figure it out in order to secure her chance of staying ahead. Education is key. But access to education is what’s making students like Samiyah unable to reach their potentials. Why don’t we invest in education? Why don’t we pay teachers a higher wage? Why don’t we build state-of the-art facilities and provide textbooks and technology to support learning and their success? The bigger question is who benefits from a nation of uneducated people? Who is the benefactor to all of this? Samiyah has been in accelerated math classes since middle school. In eighth grade, she was forced to take an online math class because the school didn’t have enough students to justify paying a teacher to teach it. She is gifted, and yet, the school system did not have adequate resources to help support her gift. She is gifted, yet her school is not. Don’t get me wrong, when she was placed in the gifted class because of her test scores and math grades, I was thrilled. I knew she was a smart child, and I was certain her brilliance in math did not come from me. I was thankful that her teacher recommended her to the AG class and I knew she would be blessed because of it. But to have a gift and then not be able to materialize it is equally challenging. I quickly moved into position to find help. I reached out to her teacher who said Samiyah was welcome to attend the Smart Lunch period so she could get some extra help. I scoured the internet for a math tutor and online resources. I asked a dear friend who was a wiz in math to sit with her on Saturday to assess her abilities. I, like most parents, wanted to make sure she got the help she needed. I wanted her to succeed. We discovered that Samiyah’s class does not come with a textbook. The teacher did, however, offer to send Samiyah home with a textbook she had — but warned me, that the book hadn’t been updated in 15 years. Her classroom currently only provides worksheets and notes and links to external online sites that are not accredited. This was alarming to me. And while I am zoned in on my own child, I am more disturbed by the millions of students who are going through similar issues. How many other Samiyahs are out there? What about the countless brilliant, average, and second-chance students out there who need our help? What happens to them when we don’t fund education? Students deserve basic resources – like adequate school buildings, qualified teachers, books to read and textbooks to learn from, support staff that includes health professionals, and more. They deserve our concern if nothing else. They deserve our attention. They deserve our fight. For me, private school was out of reach. And I don’t think I have to pay thousands of dollars in school tuition to gain access to a better education. I don’t. I pay thousands of dollars in taxes already. Last year, I attempted to enroll her in a high-achieving charter school, but because she was in an accelerated math track, and those classes were normally reserved for upperclassmen, she did not get in. She was No. 1 on a waiting list for 6 months and she did not get in. The public school, located in our district, was her next best choice. Plus, I needed and relied on the school bus for transportation, so this worked for my family. 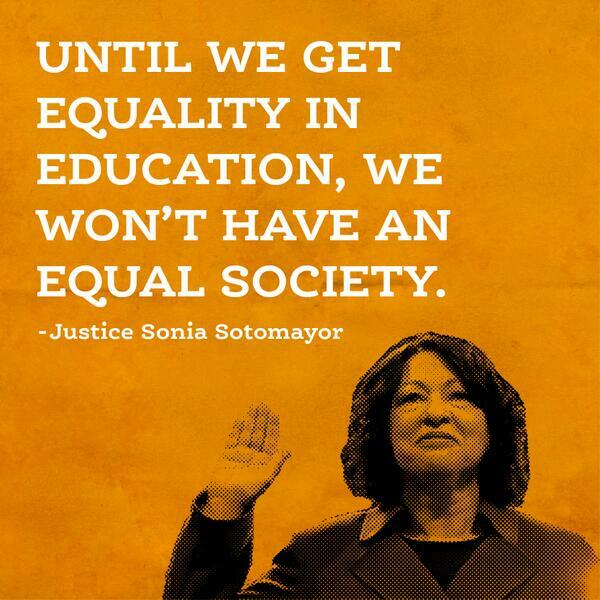 We are not just fighting for equal education, we are fighting for ACCESS to it. Access to good teachers, access to up-to-date textbooks, access to all of the resources that bring out the best in us. Access to the chances of success. There are those among us that can pay for access to education. They can afford to purchase access – enrollment, supplies, and other resources. Then there are those among us who can steal it. The consequences sometimes include jail time, or at least to those who don’t have access to legal counsel. That leaves the rest of us hard working Americans in a dilemma. If you are like me, and can’t afford to buy access to education and are unwilling to cheat the system to attain it, you will have to figure it out. Samiyah’s math skills could mean she will one day become a financial expert. It could be the key to her future as an engineer. It could be the one thing that catapults her in the field as an actuary. Who knows. But she is not alone nor is her story original. It does, however, shine a light on the reality that she may not get there. Without funding, her school won’t be able to buy textbooks or hire the right teachers. Without money, I won’t be able to afford a tutor or purchase additional resources to support her education. This is us. This is our great culture. This is why people from other countries think we are a superior nation. But this is what, in my mind, makes us inferior. I am writing the principal, the superintendent, the board and am willing to steal the ear of anyone who will listen. I will reach out to my lawmakers – at the state and federal levels – until my voice becomes egregiously annoying. Our children deserve an opportunity to live up to their great potential.